You can adjust the contrast on most microscopes just like you adjust the focus. Contrast refers to the darkness of the background relative to the specimen. Lighter specimens are easier to see on darker backgrounds. In order to see colorless or transparent specimens, you need a special type of microscope called a phase contrast microscope. 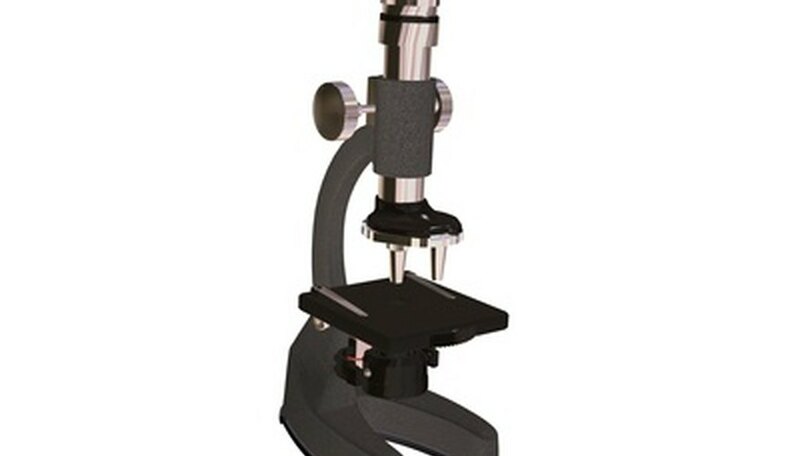 The two most common type of microscopes are bright light microscopes and phase contrast microscopes. Bright light microscopes aim light up through a condenser beneath the stage. The light goes through the underside of the specimen, the lens and the eyepiece before reaching the viewer's eye. At the eyepiece, the light is magnified. Phase contrast microscopes work by shifting light waves in order to change contrast. Light passes through both the center of the lens and the sides, but the light on the sides hits a phase plate, which delays the movement of that part of the light wave. The manipulation of parts of the light wave reduces the brightness of the object when it is viewed. Rice University states that phase contrast microscopes provide more dramatic contrast, but are too expensive for most student labs. Bright light microscopes cannot change contrast beyond a certain point, according to Rice University. If the user adjusts the contrast beyond the ideal viewing point, the object appears distorted when the viewer looks through the eyepiece. Phase contrast microscopy uses contrast to help illuminate details of living cells and other transparent micro-organisms. According to Rice University, there is little contrast between organelles within cells, making it difficult to see them using a bright light microscope. Phase contrast microscopes show much more dramatic differences in contrast, making these organelles easily viewable. To adjust the contrast in a bright light microscope, move the condenser so that it is as close to the stage as possible. Close the aperture all the way. Look through the eyepiece and check the contrast. Slowly open the aperture while continuing to view the specimen through the eyepiece. Stop when the image is bright and clear. If the image appears distorted, you have opened the aperture too much. Depending upon how the microscope is built, you will either need to slide the condenser turret or rotate it. Do so slowly while looking through the eyepiece. Stop when details of the image are sharp and bright. Ori, Jack. "Define Contrast in Microscopes." Sciencing, https://sciencing.com/define-contrast-microscopes-6516336.html. 25 April 2017. How Do Bright Light Microscopes Work?